Ever thought of taking a trip all by yourself? A trip where you don’t have to make changes in your plan according to other’s requirement; a trip which gives you ultimate freedom. If your answer to this is yes, then you should definitely travel solo! Going on a trip with a gang of friends, family or a partner is indeed fun, but things get more exciting, thrilling and flexible when you plan to travel solo. After all, a solo trip is all about you. You can plan whatever you want like a boss. A solo trip gives you a chance to try out few selfish dreams without having to make compromises with your travel buddies. Though travelling solo seems to be a little daunting task, but trust me it’s NOT. Solo travelling is fun, exciting, invigorating and incredibly liberating. There’s no way you won’t have a good time if you’re prepared for what lay ahead. But yes, you have to be prepared enough to face some challenging situations as well. They say one should travel solo at least once in their lifetime, but when it comes to girls travelling solo people are bound to raise eyebrows. Travelling alone as a woman shouldn’t be an anomaly, but sadly it still is. When a girl plans to travel solo, she gets mixed responses; some might give you an amazing supportive with words of encouragement, and some would be presumptuous and judgemental. 1. Wait, did you just say you’re travelling alone? Why is this so scandalous? Why is it still considered to be risky, frivolous pursuit for woman travellers? Well, I agree it includes risk. Everything is risky. Life is risky. But trust me so many opportunities arise when you’re open to them. But a little piece of advice never harms anyone, so girls you better be a fast runner and an even faster kicker, because you never know when you might need it. 2. You know that it’s not safe for a girl to travel alone, right? Being me a girl and let me tell you that we are not safe anywhere. And I won’t say women safety is not a concern, but that’s half the story. It’s all about travelling smart and having a presence of mind to handle things on the go. Whether you are travelling in India or abroad, with a partner or without a partner, you have to be vigilant about your surroundings. If something bad has to happen, it will, whether or not you’re travelling with someone. So just trust your gut instinct and don’t venture out everywhere as a fearless woman especially at night to avoid unforeseen circumstances. Let’s just face the truth girls, the world isn’t safe anymore and you have to be your own hero at all times. 3. You should get married and travel with your husband. Now this statement is incredibly annoying and invasive. The problem with this is the sexist attitude of people. First of all, why do I need to get married and what does my relationship status have to do with my love and passion for travel? Why there are different rules when it comes to a woman traveller. To me, the fact that women should seek permission to do anything, be it travelling or whatever, all goes back to the sexist argument of the skirt that was a little too short. Everyone’s idea of marriage is different, and I have a very hard time accepting such statements and perceptions of people where man and woman aren’t truly equal. 4. Aren’t you scared to travel solo? If you’re someone who is going to travel solo for the first time, then you’re most likely to be asked this question. But don’t worry; it’s normal to be a little scared. Of course, there are pros and cons. You might face situations where would be in a fix but but does that mean it should stop you from doing what you love? No, it just prepares you well for your next trip. And a solo trip doesn’t mean being lonely or dangerous, rather sometime travelling with someone puts you at major risk. 5. Won’t you feel lonely? In this age and day, getting some time alone out of your busy schedule has become a luxury. Not everyone is fortunate enough to get it. While travelling alone coming across lots of new people including fellow travellers and some friendly locals is inevitable. Such acquaintances leave you with unforgettable memories. And not just this but meeting a bunch of new people will help you come out of your comfort zone as well. Travelling solo will put you in situations where you might feel awkward talking to strangers at first but trust us, those chit-chats might give you lifelong friends. Opening up and talking to fellow travellers is an unwritten rule of travelling. Well a girl who plans to venture out alone, it doesn’t mean she has no one to accompany her. She plans to travel solo because she wants to. She doesn’t want her friends to make plans, prepare itinerary, and be super excited about the trip just to end up getting disappointed because everyone take a step back when it comes to executing the plan. Travelling solo will gift you with numerous memories, experiences that you may not get to enjoy when you have a comfort and security of a travel buddy. Lucky? Well may be, or may be not! Being lucky is a concept we associate when we believe something exceptionally good or magical happens to someone. But here it’s not the case. It doesn’t happen because it is destined to happen, it happens only when you are determined enough to make it happen. We are the creators of our life, it is all up to us how we want our life to be and how we shape it. So yes, you are lucky if you plan to have a thrilling and adventurous life. And to be lucky you have to work incredibly hard to make your dreams come true. 8. Aren’t you ever going to settle down, get married and have kids? Firstly, travelling has nothing to do with marriage. And if marriage stops me from travelling solo then it’s not on the cards. Well, this also depends on the partner I choose to be with. But, dear girls, if you are tired of such discussions, just a simple No will also do. 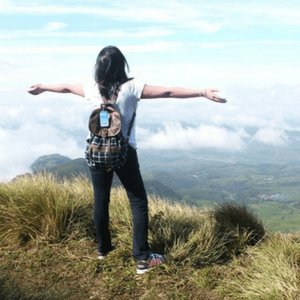 Accept the fact that it is still socially unacceptable for a girl to travel solo. And if you’ve finally made up your mind to travel solo then you must be a woman who doesn’t follow the stupid societal norms. Because living a conventional, typical life is not every ones cup of tea. 9. What are you running from? Travelling solo does not mean running away, it means running towards your desires, freedom, and travel goals. In fact, it means overcoming your fear of the unknown. If you still want to call it running away, then yes it’s perhaps an attempt to run away from a monotonous, mundane and dull life. 10. How will you manage in a place where people speak different language? Well don’t ever let the fear of not knowing the language let you hold back, because if you do so then you going to miss out on a lot of amazing experiences. Not knowing the local language might create a trouble at some point for you but you should see the brighter side too. Being in a different country with people speaking a different language gives you a chance to learn a foreign language. And in most of the countries people speak English, or at least know basic English. If this doesn’t work then you could always use the hand gestures, but not the wrong ones. if nothing else works, you can always resort to Google translator. But make sure you don’t look blank and stupid that people will make a fool out of you. Rajasthan Holiday Packages for the people who like digging deep in the royal history. Consider Himachal Holiday Packages if you are a mountain bum and like adventure sports, snowy peaks and plungy river valleys. If chilling on a beach, getting tanned and partying like there’s no tomorrow is your thing then you can book your Goa holiday package. We also provide you with a list of amazing international destinations which you could explore on a domestic budget. Thailand Holiday Packages for the quintessential backpackers. Vietnam Holiday Packages for women solo travellers who would love to explore and have a relaxing solo trip. Bali Holiday Packages for women who enjoy vacationing in a diverse and laid-back part of the world. Ever thought of taking a trip all by yourself? Let's have a look at the things a girl get to hear when she plans to travel solo.